The training for the leadership development was conducted by ICA Nepal from March 20-23, 2018. It was a four days long training provided to Welt Hunger Hilfe and RIMS by ICA Nepal. There were total 18 participants present in the training session. Training sessions were conducted by using various tools. The first way used was the presentation. Seminar presentations were conducted to teach the participants. Similarly, meta-cards and chat papers were also used during the training session as the training tool. These were used mainly with the motive of making learning easier and interesting for the participants. The other method used for the training was the ORID method. This method of training focused mainly on the interaction. In this method the participant were given the platform to have discussion and to share their ideas and thoughts among themselves and with the trainers. This framework enabled detailed reflection and learning and helped groups to get to the heart of the matter efficiently. The certifications were provided to the participants on the last day of the training. 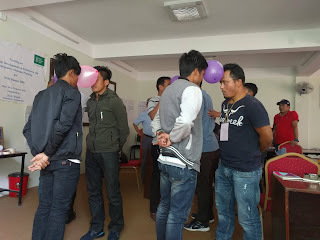 In this way four days training for leadership development was successfully conducted by the ICA Nepal which was facilitated by Dr. Tatwa Timsina and co-facilitator were Mr. Hare Ram Bhattarai and Mr. Amba Datta. also given that helps them build up relationship based on mutual understanding. In addition project planning, proposal writing and fund raising, monitoring and evaluation training as well as training on social ethics were also provided to the participants.